The goal of the Stepgreen project is to leverage Internet scale technologies to create opportunities for reduced energy consumption. The original vision of the project was to leverage existing online social networks to encourage individual change. Since then the project has broadened to include a number of other ideas. We have explored the impact of demographics on energy use practices; studied the value of empathetic figures such as a polar bear for motivation and exploredorganizational-level planning. We have also developed mobile technologies that can provide feedback about green actions on the go. Try StepGreen.org out: The Stepgreen.org website provides a mechanism for allowing individuals to report on and track their environmental impact. It includes a visualization that can be displayed on an individual’s social networking web page. 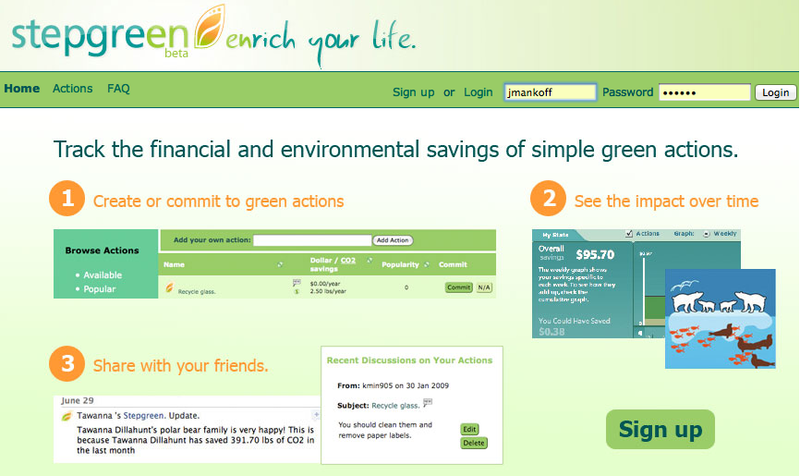 Go to Stepgreen.organd see for yourself how we leverage social networks to engage individuals in green behaviors. Learn about our software products. Stepgreen is a service that we are hoping to share with non-profits that are encouraging behavior change, such as an open API you can use to build your own clients for encouraging green behavior. Please contact us at stepgreen@cs.cmu.edu if you are interested in collaborating with us. Keep in touch with us through our Facebook page and Twitter account. J. Mankoff. “HCI and Sustainability: A Tale of Two Motivations,” Interactions.